An exhibition of work created by Professor of Art John Blosser during his 04-05 sabbatical. Reception: Friday, Sept 30, 6-8 p.m. Reception: Thursday, Oct 20, 8-9 p.m. Reception: Sunday, Jan 8, 2-4 p.m. Reception: Sunday, Feb. 19, 2-4 p.m. Reception: Sunday, March 26, 2-4 p.m. Reception: Sunday, April 9, 2-4 p.m. Reception: Sunday, April 30, 2-4 p.m. Reception: Sept. 3, 2-4 p.m. 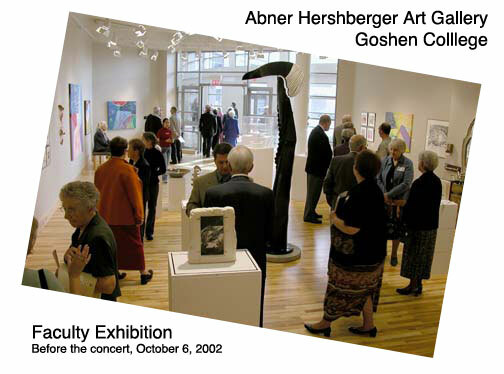 The Abner Hershberger Art Gallery is near the north lobby of the Music Center at College Avenue and 12th Streeet in Goshen, Indiana. The Library Gallery is located in the basement of the Good Library. Additional gallery hours on concert dates.